This award winning conversion retains the original charm and features of the building whilst providing very comfortable accommodation. It sleeps up to 12 and is located 100 metres through the village of Halton Gill. 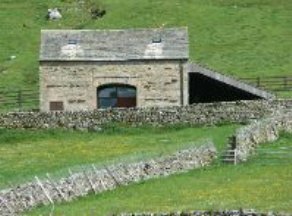 The view from the stone flagged entrance is stunning - probably the best view there is in Littondale, the heart of the Yorkshire Dales. There are three fully carpeted bedrooms on the ground floor sleeping 3, 4 and 5. The combination of beds includes two singles, two bunks, and two double beds. Each bed has a pillow; you just need to bring your own sleeping bag, or duvet and linen. There is a separate shower, a separate toilet, and an additional bathroom with toilet, shower and two wash basins. Upstairs is the very comfortable, fully carpeted living room, which leads to a small mezzanine area with sofa bed, overlooking the gallery. We have installed Sky along with a DVD player & VCR, or you can make use of our eclectic selection of books games and videos.